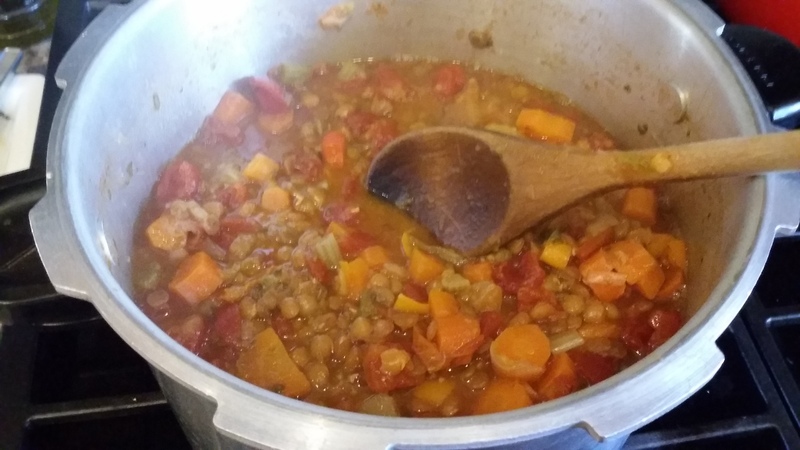 One of my friends turned me onto this soup and I have come up with my own recipe. It is quick, easy and if you have a pressure cooker, fast. Pour out lentils and sort through to make sure there aren’t any small stones. Saute onion and garlic in the bottom of the pressure cooker with a little olive oil. Add in the rest of the chopped vegetables and saute for 3 – 5 minutes just to sweat them. Add in vegetable broth, herbs and diced tomatoes and place the lid on the pressure cooker. Bring up to pressure and keep at pressure for 3 minutes. Turn off stove and let cool a little before carefully releasing pressure. Taste and add salt and pepper if necessary.